Unforeseen changes to a construction project are a common cause of friction between homeowners and contractors, condo buyers and developers — particularly when communication efforts go off the rails. Now, there’s an app to help smooth over those differences. RENOMii, an easy-to-use software application, facilitates change orders and keeps the lines of communication open between contractors and homeowners during renovations. Mii Casa is its sister software, targeting condo buyers and developers. More on that later. Barker has worked in sales and project management in the renovation sector in the Kitchener-Waterloo, Ont. area for about 20 years and, along with chief operating officer Kara Smith, took part in business incubator programs to launch the company in March 2013. Their concept was to come up with cloud-based software that enables homeowners and contractors to communicate instantly when changes or problems arise, greatly reducing the chances of confusion that can be costly to both sides. Contractors create a project in the program which they invite the homeowners to review. The homeowners receive a notification from RENOMii which allows them to approve or reject any changes to the project and view the cost. These changes are directly communicated to the contractor and a record is generated, with communications and approvals available for review at any time. All files, contracts and approvals can be accessed and reviewed on any smart device. About 60 contractors have started using RENOMii since it launched in June 2014, but it’s about to be sold as a gift card in 531 Home Hardware stores across Canada. 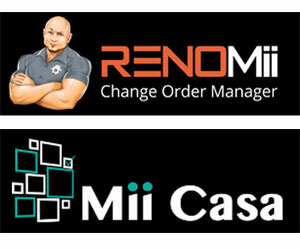 The new RENOMii card will be launched at the Home Hardware Dealer Market in St. Jacobs, Ont. on Sunday. That has Barker projecting year-end sales of 5,000. RENOMii will introduce a French version for the Quebec market in the second half of 2015. The RENOMii “pay-as-you-go” option is a $99-per-project fee that gives contractors 100 megabytes of storage, free support and the ability to add unlimited company users. The $1,299 annual and $125 monthly plans give contractors unlimited projects, 500 megabytes of storage and free support. Barker said there may be some initial grumbling about the cost, but most contractors build it into their project quotes. “If you’re losing on average $3,000 to $4,000 wrapped around change when you’re looking at discrepancies, and we charge you $100 a job, it makes sense for contractors,” said Barker. Waterloo’s Momentum Developments was so impressed with RENOMii’s capabilities that it approached the company about creating a cloud-based software solution that enables condominium buyers to choose upgrades and design their home via a smart device. Mii Casa was launched in January. “We’ve built software that’s a simplified user experience where the condo purchasers go into Momentum for their first meeting and set up a system with their email,” explained Barker. “They get a password and get assigned their unit and then they go home and go into the cloud-based software and basically online shop for all of their upgrades. Mii Casa is being used by Momentum on a 195-unit condo being built at 1 Victoria St. in Kitchener. “They’re tracking a 30 per cent increase in upgrades and 50 per cent less time from the administrative standpoint,” Barker said. Mii Casa costs $25,000 for “medium-sized builds” and Barker expects to charge “$100 a door” for use in larger buildings. The software will be used at another Momentum project, the 276-unit One Hundred located farther north on Victoria Street, later this spring. A sales and marketing campaign is being put together and Barker hopes to have 10 developers on board with Mii Casa by the end of the year.